The market of flexible and coworking spaces is rapidly developing in Poland. Like Western Europe and the USA, the market share of operators offering flexible solutions continues to grow. It is worth noting that, for example, companies offering flexible spaces in the centre of London claimed a 20% share of total demand in 2017. This clearly illustrates that the growth of this sector is extremely high. Although Poland still has a long way to go to match the UK's capital, our country has been seeing a marked recovery in the market for flexible offices and coworking spaces over the past few years. Between the beginning of 2017 and the end of Q1 2018, demand generated in the Central Business District of Warsaw by flexible space operators accounted for 16% of total demand for new office space. It is also important that operators are more frequently leasing large spaces. Recently, for example, the Cambridge Innovation Center (CIC), which will serve as an accelerator and flexible space, may have up to several thousand sq m ready for use. Our data shows that flexible spaces currently occupy approximately 130,000 sq m in Poland, which equates to filling the two office buildings of Rondo 1. A majority - about 70% - of such spaces are in Warsaw. However, you can see a lot of interest from the sector's operators in other major cities in Poland. This is a natural process in which companies start to operate in the capital, and then look to establish business in other locations. It is also worth mentioning that the three major players in the market account for more than half of the flexible office space. The potential of this type of space was noticed some time ago by developers of office buildings. Skanska, Echo Investment, Ghelamco and HB Reavis all develop their projects and co-operate on flexible concepts so as to be able to offer high-quality office space not only to large corporations, but also smaller companies, start-ups and freelancers. Flexible space is also a very good solution for companies that have just entered the Polish market and need a temporary location, where they can begin their recruitment processes while waiting to be located to their permanent office. Furthermore, more frequently - especially in Western Europe and the US - corporations are becoming increasingly interested in the coworking option. Nowadays, Microsoft and UBS place a number of their employees in such spaces. This trend will also be increasingly visible in Poland. Now some operators even focus on corporations and treat them as their main potential customers. The rapid development of flexible spaces can also be affected by legislative changes such as IFRS16 - the new accounting standards. Companies now have to put all lease agreements concluded for a period of more than one year on the company's balance sheet. As a consequence, some companies are looking at flexible solutions which allow for a short term office lease. What is the future of flexible offices in Poland? I think that this market will continue to grow and mature, it will attract the largest global players but smaller companies will also be able to find a place. 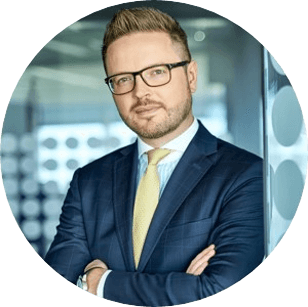 Mateusz Polkowski is the Head of Research and Consulting at JLL Poland and leads a team of 8 analytics. He has over 15 years' experience on the commercial real estate market. When working for JLL he was responsible for numerous research and advisory reports, feasibility studies and other well-known reports for companies such as ING RED, Skanska, IVG, Mayland, Torca, Nexity, Mennica Państwowa, Invesco, Link 4, Apollo Rida, Global Partners, Bouygues Immobilier, Ghelamco, Penta and many other. He is also the author and co-author of JLL publications connected with the commercial real estate market, its trends and forecast. Mateusz graduated from Real Estate University in Warsaw with a specialization in Property Management. He is active member of PORF (former Warsaw Research Forum). Furthermore, he also completed CCIM financial and market analysis courses and holds the title of LEED Green Associate since 2011.